New York Times Acclaimed Feline Behavior Science Author and Certified Cat Behaviorist Mieshelle Nagelschneider Has Resolved Feline Urination Behavior Cases in Over 30 Countries Since 1999. Founder and director of The Cat Behavior Clinic, Certified Cat Behaviorist Mieshelle Nagelschneider has conducted thousands of urination consultations. She is a cat expert for National Geographic documentaries and published works on cat behavior and the 37 species of tigers and wildcats as well as an acclaimed New York Times feline behavior science author for her cat behavior science book published in 4 languages (Random House Publishing). 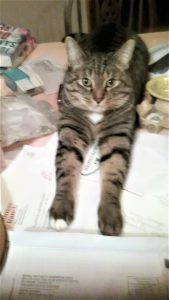 Behavior Plans For Lasting Success: Most of the Cat Owners We Work With Think They Have Tried Everything to Solve Their Cat’s Issue. The Clinic Goes Beyond the Obvious Behavior Strategies and Facts During the Urination Behavior Consultation with Trusted Solutions Based on Your Cat’s Evolutionary Biology, but most importantly provides you with a comprehensive behavior plan which is the key to lasting success. See our outstanding clinic success rate. Dublin no longer urinates or urine spray-marks after following the behavior program for 30 days. 2019 Success with Doolittle who now uses the litter box 100% of the time as of day one of the behavior plan. Bobo is now using the litter box 100% of the time. As founder and director of The Cat Behavior Clinic, she has extensively lectured at the international level for education conventions for veterinarians from the Philippines to Australia including TICA and Humane Society/SPCA on this very common, yet very complex, behavior issue. To schedule please call the clinic at 503-267-8888 or begin the process through the clinic website. Mieshelle Nagelschneider (center) on The Hallmark Channel’s Home & Family Show as Arm & Hammer Cat Litter Spokesperson Speaking on Solving Cat Urination Behavior Issues. 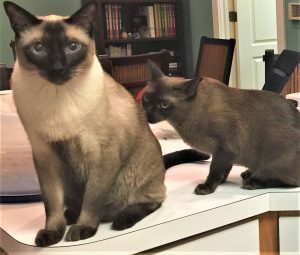 December 2018 Phone Consult Client Testimonial Update: Darrel P. Tennessee December 2018 (S’mores kitten at right). This includes up to 2 hour of consultation time. This program begins with a one-hour phone or video consult and 1 to 2 subsequent consultations during the 4 week period. During the urination consultation, Mieshelle goes beyond the obvious facts and solutions and gives an intelligent and effective Feline Behavior Science C.A.T.™ Behavior Plan to solve your cat’s urination issue. Through April 30th receive the reduced consultation fee of $250.00 if you take part in our feline clinic data study for either social facilitation or inter-cat aggression. To be eligible your cat must not be feral. Feel free to call the clinic at 1-503-267-8888 to schedule this consultation. Or book here. 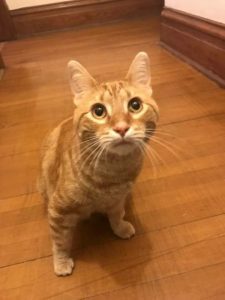 In-home consultations are also conducted and accepted on a case-by-case basis by the veterinarian Dr. Jim Shultz and cat behaviorist with a different fee schedule. 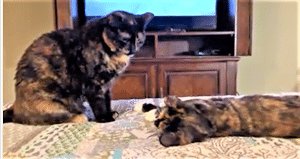 An Actual Video Cat Behavior Consultation with Mieshelle Nagelschneider. 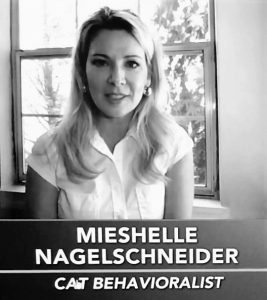 Watch Mieshelle on National Geographic as their Cat Behavior Expert. Our goal is to create a greater awareness of the seriousness of this common behavior problem. On average, cat behavior issues – spraying and inappropriate urination – are more pernicious and destructive than the behavior problems of their canine counterparts. These behavior issues are the number-one reasons millions of cats are surrendered to cat shelters each year and even euthanized. The retraining process to ensure your cat deposits all his urine in the litter box — every time. Most of our clients have success in the first week of following the methods. The un-training process of unwanted behavior which is so crucial for this issue and must be implemented correctly for long lasting 100% success. How a litter box issue is rarely just a litter box issue. It can begin as a simple issue, but then manifest into several issues rolled into one with many interdependent variables (anyone for a game of chess?). Our cat behaviorist or doctor help you and your cat with an issue that you probably didn’t realize had turned into a complex one where cookie cutter advice isn’t appropriate. How your own behavior may be contributing to the unwanted urination problem (learn all about what you didn’t know). Savvy cat owners, too. 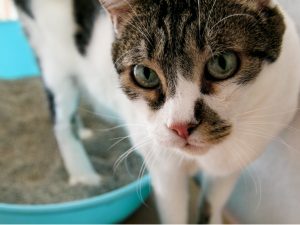 Learn why litter box issues can lead to urine spraying (and urine spraying can lead to urination issues). It’s not all about adding boxes. Learn how your cat’s innate instincts directly affect his litter box needs and how you can make changes to meet these needs as part of an all-encompassing behavior plan based on your cat’s feline evolutionary biology. The latest behavior modification techniques to undo the habituated behavior in specific urination areas to prevent future urination. Why social tension between cats is often an instigating factor for litter box issues — and what to do about it (and not just for litter box solutions, but also because your cats deserve to be happy and coexisting peacefully). Learn why cats and kittens urinate on the bed, sofas, gym bags, bath mats, sinks, or right in front of you (or on you), and how to solve the issue. Litter box issues can also be the most expensive to deal with. We’ve known clients whose cats had ruined two homes before they came to us. How, you ask? The urine had gotten onto the floors by the cats urinating there and even on the walls (this is a marking behavior that can actually be caused by litter box territory issues with your multi-cat household), and then the urine cleaner did too, so that the sheet rock was ruined and they had to replace the paint. The urine that dripped down the wall went behind the baseboards, so that they too had to be peeled away and replaced. Urine got under the sub-flooring, so that they had to remove the carpet, pad, and sub-flooring. There was urine in light sockets and in floor heater vents! Of course, after our consultation, none of this ever happened again. Litter box issues are often more than something just about the litter box. Your cat could also have developed a habituated behavior and preference for certain locations. There may also be a territorial time-sharing issue with your multi-cat household which is why your average cat consultant will have no idea how to solve your cat’s “litter box” issue. This is where formal education in animal behavior is important, because it’s not just about the litter box. A skilled behaviorist knows how to undo habituated and rehearsed behavior in a science-based and humane way. An effective behavior plan is like an orchestra with many pieces working together simultaneously. Mieshelle solves “unfixable” issues by going beyond the obvious facts and offers a creative and intelligent behavior plan for your cat(s). If only more cat owners knew what the Cat Behavior Clinic teaches its clients every day, far fewer cats would be given up to shelters or even euthanized (currently millions each year). It’s a tragedy that so many cat owners are at a loss about how to stop the very preventable behavior of cats urinating outside the litter box. A litter box issue is rarely just a litter box issue. It can begin as a simple issue, but then manifest into several issues rolled into one with many interdependent variables (anyone for a game of chess?). Let our behaviorist help you and your cat(s) with an issue that you probably didn’t realize had turned into a complex one where cookie cutter advice isn’t appropriate. Cats urinating outside the litter box is the most common and preventable behavior problem, but can also be one of the most complex. Ready to join the many clients whose peeing issues we’ve solved? Get advice that will last you the rest of your cat-owning life. Book your cat behavior consultation today.